Mitsui Fudosan Co., Ltd, a leading global real estate company headquartered in Tokyo, announced today that through its U.S. subsidiary Mitsui Fudosan America, Inc. (CEO: John Westerfield), it completed construction of 55 Hudson Yards, an office building development project that has been underway since 2015 in Manhattan, New York. 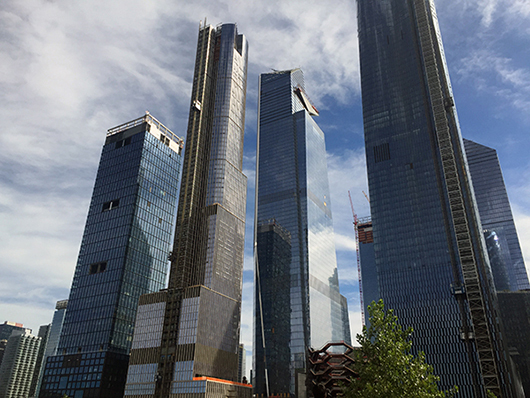 55 Hudson Yards is one of a group of buildings comprising Hudson Yards, the largest-scale mixed use redevelopment project in Manhattan. 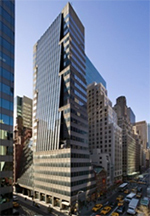 It is the largest ever office building development by a Japanese company in Manhattan, based on floor area. The total project value of Mitsui Fudosan is approximately \150 billion, of which Mitsui Fudosan’s share is 90%. The building is nearly fully leased. 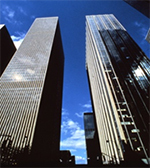 Tenants are mainly financial companies and major law firms, which represent two of Manhattan’s main business sectors. 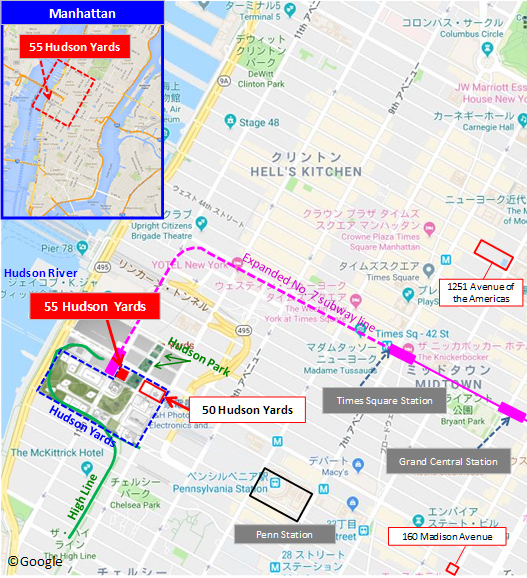 As with 50 Hudson Yards, upon which construction started in 2017, Mitsui Fudosan regards 55 Hudson Yards as a flagship building that will be at the core of its portfolio for future overseas business. 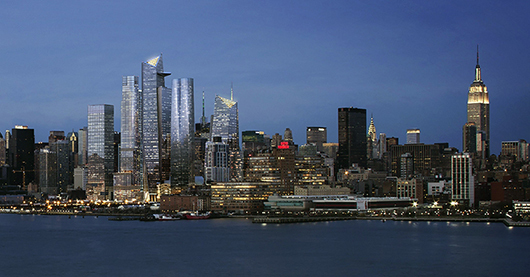 In addition to offering an opportunity to expand Mitsui Fudosan’s overseas operations, the project will utilize the expertise accumulated though the urban development and neighborhood creation projects Mitsui Fudosan has undertaken in Japan to add further value to the Hudson Yards project. Hudson Yards is an entirely new neighborhood located on Manhattan’s West Side, which has undergone remarkable resurgence in recent years. When complete, Hudson Yards will bring more than 18 million-plus square feet of mixed-use development to New York City. 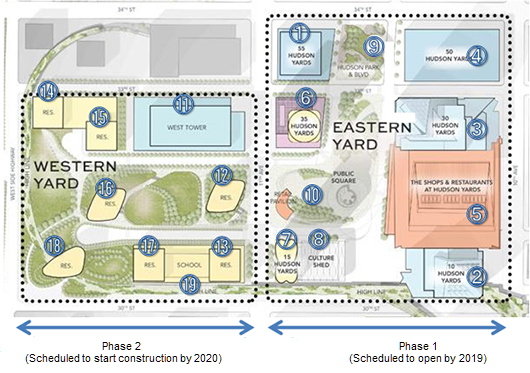 The site includes more than 100 shops, including New York City’s first Neiman Marcus; signature restaurants and food experiences by Chefs and Restaurateurs Thomas Keller, José Andrés, David Chang, Michael Lomonaco, Costas Spiliadis, rhubarb and D&D London; new residences; 14-acres of public open space; a new 750-seat public school and a hotel with more than 200 rooms – all offering unparalleled amenities for residents, employees and guests. Adjacent to the development, the 3.9 acre (approx. 1.6 hectare) Hudson Park and Boulevard is scheduled to open, and the already completed High Line, a greenway built on an abandoned elevated freight line, is also planned to offer direct access. The Hudson Yards development is led by Related Companies (“Related”), one of the biggest developers in the U.S., and by the Oxford Properties Group (“Oxford”), the real estate investment and development arm of one of Canada’s largest institutional investors. This project is being conducted jointly with Related and Oxford. Housing mainly office space, 55 Hudson Yards has 51 floors above ground and a floor area of 1,265,700ft2(approx. 118,000m2). This state-of-the-art office building is adjacent to the nearest subway station and Hudson Boulevard Park at its main entrance. 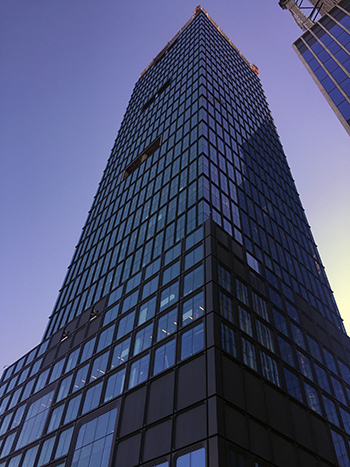 The building features excellent vistas of the Hudson River to the west and Hudson Boulevard Park to the east, with an expansive 360 degree terrace at the top of the podium and additional tower and podium terraces to make the most of the views. It offers superior environmental performance and is expected to achieve LEED Gold certification, a floor plate that allows an efficient layout, and a stunning exterior that incorporates the historic cast iron architecture, which was widely used in the Manhattan/SoHo area in the 19th century. The Mitsui Fudosan Group’s long-term management policy, Vision 2025, includes the aim to evolve into a global company, and dramatic growth overseas is expected in the future. The Group is engaged in business in Asia, including China, Taiwan and Southeast Asia, in addition to the U.S. and U.K. 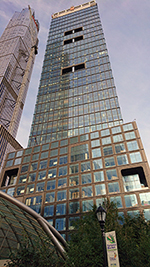 In the U.S., Mitsui Fudosan is engaged in multiple developments including offices and housing. 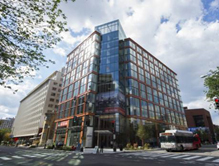 In March 2018, the Mitsui Fudosan Group took part in the Robinson Landing project, its first residential community (condominium and townhome) project in the Washington D.C. area. Business is expanding in multiple cities and Mitsui Fudosan aims to capture further business opportunities going forward. Hudson Yards is situated for highly convenient access to public transportation. The No. 7 subway line linking Times Square and Grand Central Station was extended and a new station opened in 2015. Penn Station, the departure point for long-distance trains as well as the Long Island Rail Road and New Jersey Transit commuter services, is also within walking distance. Plans for this development include five state-of-the-art office buildings, more than 100 stores, restaurants, about 4,000 residences, unique cultural properties, public open space, a public school, and a luxury hotel. 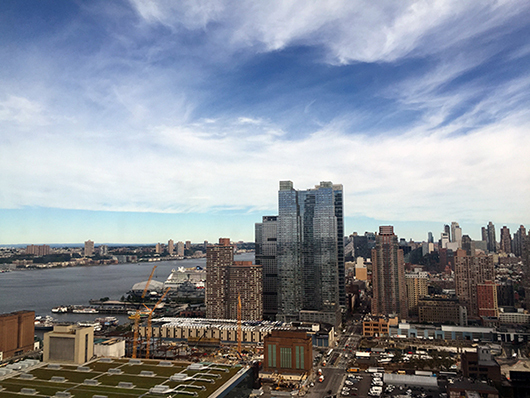 Hudson Yards is a rare example of a central city development area that features ample greenery and space for relaxation. 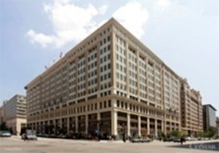 Office development business in the U.S.